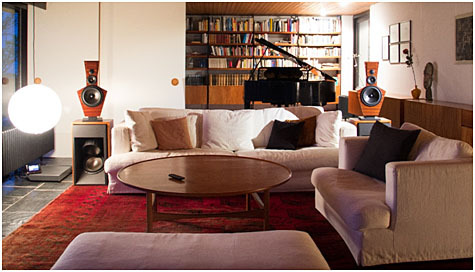 The LX521.4 exemplifies the best of what I have observed and learned in 50 years of experimentation about rendering stereo recordings in domestic living spaces. I love music. 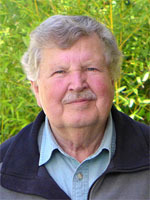 Life's circumstances prevented me from learning to play an instrument, but I make up for it by enjoying the creations of great composers and the art of musicians. 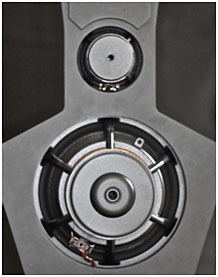 I have designed speakers first of all for myself and free of commercial pressures. With the LX521.4 I have arrived at a level of performance, which makes me search no further. Instead I gratefully enjoy what I can hear. I excuse the recording/mixing engineer for his or her imprint and marginal acoustic scene capture, as long as the music still comes through. 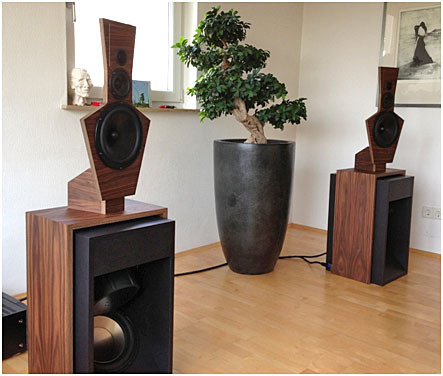 As hired engineers they work within a set of imposed limitations, one of which is the typical monitor loudspeaker. 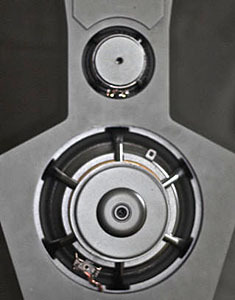 The LX521.4 is a 4-way loudspeaker, designed as full-range dipole, for flat on-axis and off-axis response in the horizontal plane and frontal hemisphere. 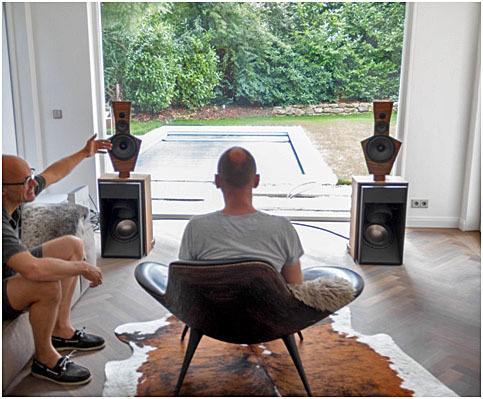 The speakers need breathing room of at least 1 m to the nearest large reflecting surfaces and a room with a minimum floor size of 25 sqm. 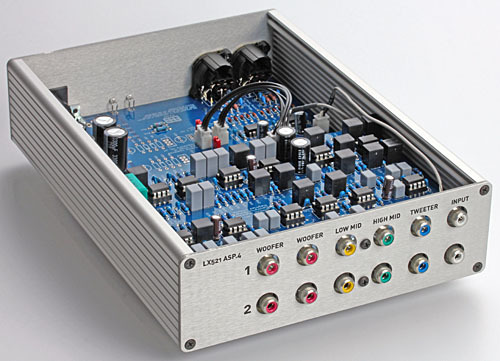 The LX521.4 can be built DIY from a Kit for around $3300, including a miniDSP 4x10HD equalizer/crossover. 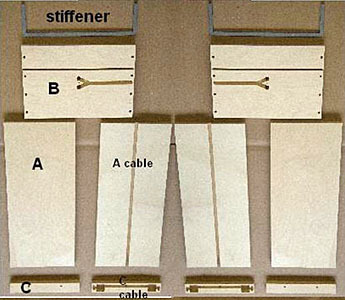 Additionally, the speaker requires between 8 to10 power amplifiers of 50 W to 200 W.
I offer via Hairball Audio the ASP.4 PCBs on their own, as well as in a 5 piece set for the Hammond case. 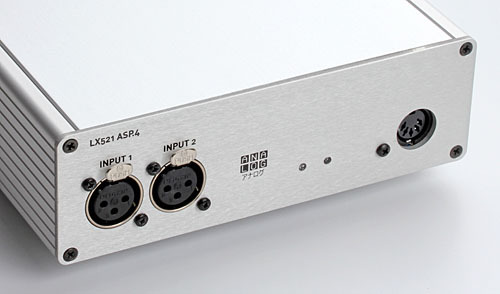 Two boards are the ASP.4s, another is a power supply that can be configured to accept an external Mean Well +/-15 GP50A14E-R1B, or an externally housed center tapped transformer like the Hammond 1182J15 that can also connect through the DIN plug. The power board also has an option for balanced inputs using THAT devices. 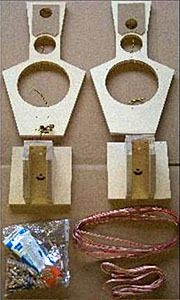 The other two boards are panels that will fit the Hammond case with countersunk holes. It is intended to double as a template that users can create their own panel with. 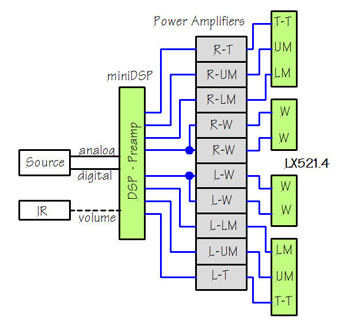 LX521.4 Analog Signal Processor with balanced inputs and outputs. There is a new, enhanced ASP for LX521.4 available. Based on physically small feedback loops with single OpAmps and tight component tolerances for improved L/R channel matching. DSP with analog and digital inputs, and remote volume control. A separate preamp is not needed. 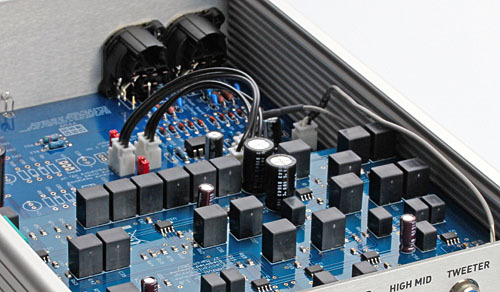 The DSP drives the 8x 150W or 10x 50W power amplifiers required for the system. Worldwide shipping: e.g. EU 55€ / US&CAN 159€ / world 199€ , prices vary when 12 SEAS drivers ship with the kit. Kit does not contain: electronic crossover/amp/amp-cables, paint, glue, plans/license from www.linkwitzlab.com. Kit does not contain: paint, glue, plans/license from www.linkwitzlab.com. Send proof of Plans/License ownership to <plans@magicLX521.com>. 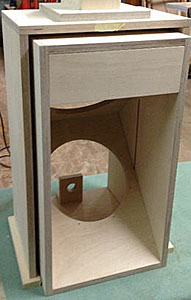 Baffle supports assembled and glued. 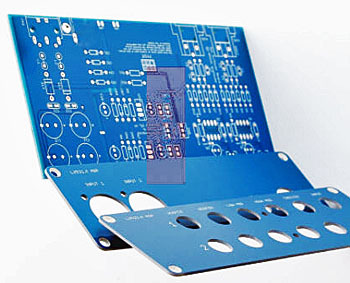 Slim baseplate. 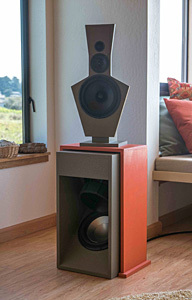 Bridges without feet, SpeakOn 8 pole plug holder.integrated. 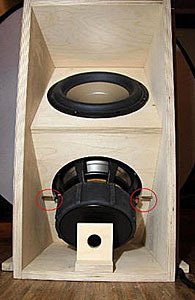 DIY part: Woofer V-Frame assembly, (Clear) lacquering, Driver insertion an cabling according construction plans. 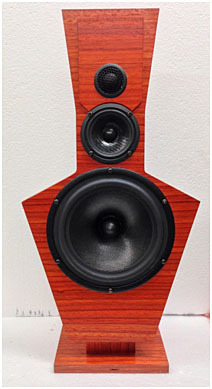 Top baffles and bridges are custom built in various precious veneer plywood types. Choose your preference! 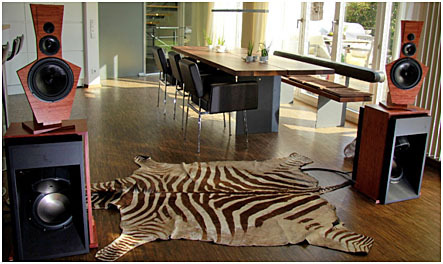 Standard and popular selections are e.g. Bubinga, American Walnut, Paduk, Mahogany and Oak. 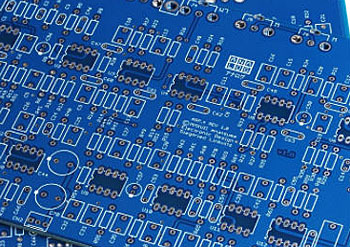 Surfaces are finished by oil, or transparent lacquer (dull / silk gloss). Upgrades to 3-layer massive wood types (e.g. Oak, Cherry, Walnut or Ash) or to Panzerholz possible. Hidden cabling in all aspects. One PowerBox as MASTER and a .PowerBox as FOLLOWER. Due to weight restrictions per parcel, upper woofer drivers ship in a separate parcel and must be inserted by customer with 8 bolts&nuts. 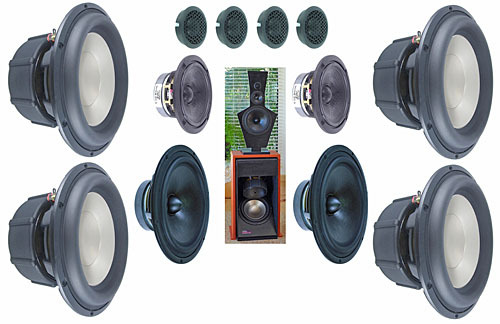 Inquire about alternative shipping as one 120kg airfreight pallet of fully assembled (all woofer drivers inserted) and tested loudspeakers: ca €800 to €1000 from Germany to the US.